For Rogers too much of research focuses on the differences between on- and offline culture. He sees the reason for this in the methods with which researchers from the humanities and the social sciences approach the internet. Rogers’ critiques the use of surveys, interviews and other approaches that proved succesfull in offline research. He collects these methods under the term virtual methods. To him the exclusive use of these virtual methods leads to an unnessary concentration of research on just a few topics and would even mislead in the quest to advance our understanding the internet. Rogers suggests that through the use of digital methods we will be able to use the internet as a data source that informs on social processes offline that until now remained hidden. Rogers then moves on and discusses a group of epistemological elements of the interent that can serve as basis for research using digital methods. These elements are The Link, The Website, The Search Engines & the Spheres, The Webs, Social Networking Sites & Post-demographics, and Wikipedia & Networked Content. For each element he discusses recent research and further research possibilities. Rogers’ text is a welcome addition to the developing debate about computational social science. While the manifesto Computational Social Science by the luminaries of the field David Lazer, Alex Pentland, Lada Adamic, Sinan Aral, Albert-László Barabási, Devon Brewer, Nicholas Christakis, Noshir Contractor, James Fowler, Myron Gutmann, Tony Jebara, Gary King, Michael Macy, Deb Roy, and Marshall Van Alstyne opens up a promising research field there are also real dangers lurking. Be it data driven web sience, digital methods, analysis of social networks, or computational social science, these field are blessed by an ever increasing amount of data. While the best research in these fields does not forget theory, the more data we get the louder the voices become that proclaim the end of theory: All theory has become obsolete. The truth is in the data all apparent to mighty algorithms. For an example of such an argument see Chris Anderson’s unfortunate essay The End of Theory: The Data Deluge Makes the Scientific Method Obsolete. Rogers’ text offers a welcome example how to combine theory and data. Rogers’ text is also a timely reminder that there is more to a science of the web than just the analysis of opportunity data sets. The richness of data collected on Twitter or Facebook can serve as basis for original research (for an example of an analysis based on data sets collected on Twitter see for example Drew Conway’ s post “SNA in R Talk, Updated with [Better] Video “; for research based on Facebook data sets see “How to split up the US” by Pete Warden). In the short term analyses like these can provide original and valuable insights. Still, if this research is not conducted in a larger research context we risk losing sight of the bigger picture. But Roger’s text does not only offer interesting perspectives to researchers coming from a data perspective. “The End of the Virtual” also offers an interesting advancement to researchers coming from the humanties or the social sciences. Rogers directs their focus away from shiny “new” phenomena on the web towards the data structure behind these phenomena. This might curb the enthusiasm of some research but at the same time advance our knowlegde about the web at large and the conditions of social action online. The End of the Virtual can be found either in bookform here or a pre-print of the lecture as pdf on Richard Rogers’ website. 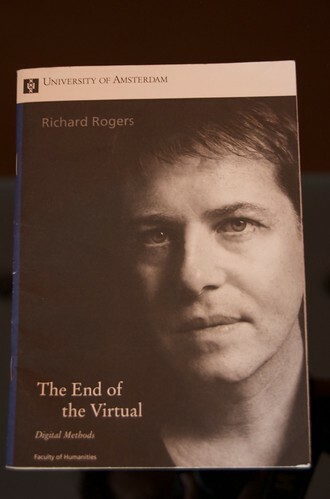 Disclaimer: Richard Rogers sent me a free copy of his “The End of the Virtual”.